This is my favorite breakfast. There’s a step-by-step tutorial for Swedish Pancakes on this post. My husband is really good at making these and he manages 2 crêpe pans at a time. Beat the egg and milk in a small bowl. Add the milk mixture to the dry ingredients. Stir to make a thin batter, being careful not to overmix. When adding the milk mixture, add about half the mixture to make a thick batter. Using a wisk, stir to incorporate all the dry ingredients. Then add the remaining milk mixture and incorporate. This technique produces a smooth batter with less air bubbles. Directions for Crêpe Pan: Lightly grease the pan with oil before your first crêpe. There is enough butter in the batter to keep the pan greased as you continue. Pour about 1/3 cup of the batter into the pan and swirl it around the bottom to form an even pancake. Cook each pancake about 1 minute on each side, until lightly browned. Directions for Swedish Pancake Pan: Lightly grease each round cup in the pan with oil. Pour about 2 tablespoons of batter into each of the cups and cook until bubbles form on the top, about 1 minute. Turn with a spatula and cook on the second side until golden, about 1 minute. As you go, gently stir the batter as there is a tendency for the butter to separate out of the mix. Move each cooked pancake to a warm tray in the oven, 200 degrees F, while you cook the remaining pancakes. 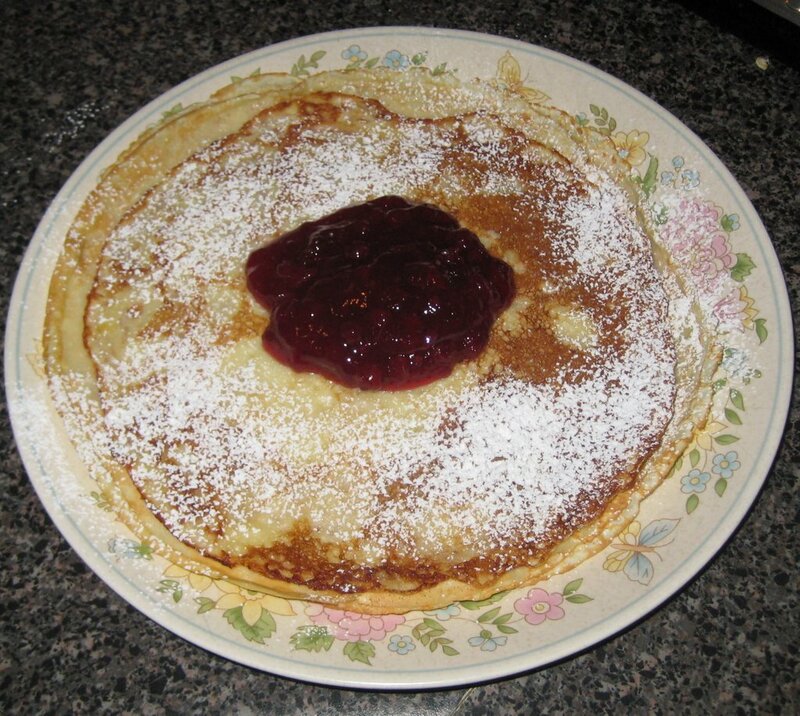 When all pancakes are cooked serve hot with sour cream or lingonberry jam. Sprinkle lightly with powdered sugar.